Current Chief Minister of India | You need this knowledge about the Current Chief Minister of India if you're preparing for any competitive exams or even at your school you will need such knowledge for your exams and it will only sharpen up your General Knowledge that will keep you ahead of many others. 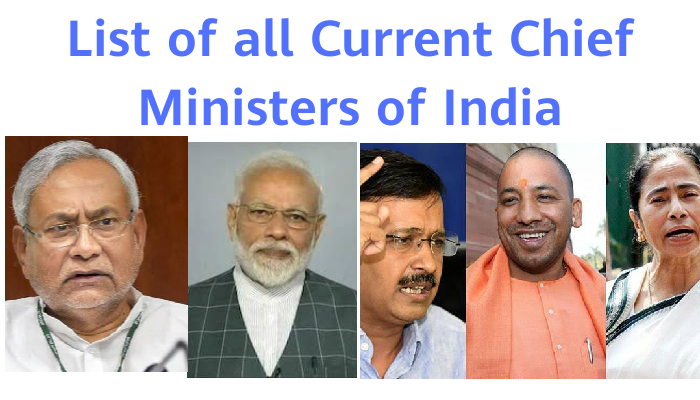 So to make sure that you are fully prepared for the upcoming exams and to keep you ahead of many others in this article, we will know about all the Current Chief Minister of India. India is a country of Diversity. India is associated with many different states and Union Territories. There are 29 states and 7 UT in total where every different state has a different culture, language, and way of living. Every state has its own Legislative Assembly and a chief minister is elected for the smooth conduct of the law and order. Delhi and Puducherry are two states which fall under the central government but have their own state legislative assembly. Here we will learn about Current Chief Minister of India along with the Current Governors and Lieutenant Governor & Administrator. Along with the list of Current Chief Minister of India below we have also provided the List of all the Lieutenant Governor & Administrator. These were all the names of the current CM in different states along with the governor and Lieutenant Governor. This is the basic general knowledge you must know in order to be always on top and that was what the motive behind providing these infromations about the Current Chief Minister of India . We hope you like it. Here, we provided you about Current Chief Minister of India. If you have any questions or query or any other information related to this article, you can let us know by dropping a message through the comment box below. We wait for the feedback and suggestions from everyone reading this article.